The Indian Motorcycle Company, America’s first motorcycle company, was founded in 1901 by engineer Oscar Hedstrom and bicycle racer George Hendee. Hedstrom began affixing small engines on Hendee’s bicycles, and from there, they quickly honed their craft, creating some of the best motorcycles of that era. 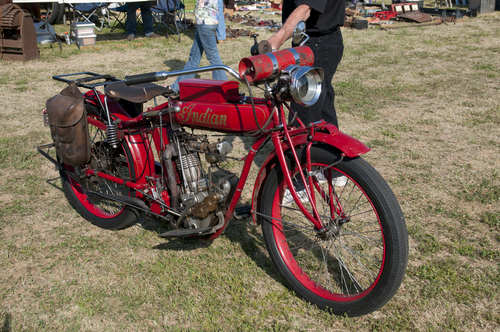 Just one year later, the first Indian Motorcycle that featured innovative chain drives and streamlined styling was sold to the public. Then in 1903, Hedstrom set the world motorcycle speed record, traveling at 56 mph. The Indian brand rolled out production two years before Harley-Davidson, and these motorcycles quickly became a force to be reckoned with, introducing the first V-twin engine, the first two-speed transmission, the first adjustable front suspension, the first electric lights and starter, and many more innovations. Indian was clearly dominant in the marketplace in its beginnings, consistently setting and breaking speed records. The motorcycle wasn’t always called such. When motorcycles began to appear in the late 19th century, there was uncertainty about what to call them. Some people called them “motocycles”. In 1923 The Hendee Manufacturing Company chose to use this term, changing their name to the Indian Motocycle Company. It was in the 1930’s that “motocycles” became known as motorcycles. Following WWII, Indian Motorcycles struggled with re-entry into the public market and Indian was forced to halt production in 1953, despite the Indian Chief being re-introduced two years prior as a mighty 80-cubic-inch model. The following decades involved a complex web of trademark rights issues that foiled numerous attempts to revive the Indian name. But in 1998, several formerly competing companies merged to become the Indian Motorcycle Company. It wasn’t until very recently that a new era of Indian Motorcycles was born. The Indian Thunder Stroke III engine was introduced at Daytona Bike Week in March of this year, and the 2014 Indian Chief was unveiled at the Sturgis Motorcycle Rally in August. Many motorcycle enthusiasts agree though, nothing compares to the classic and antique Indian Motorcycles. This entry was posted in Antique vehicle insurance, Classic Car Insurance, Vintage motorcycle insurance and tagged Antique Indian Motorcycles, Antique Motorcycle Insurance, classic indian motorcycle, Classic Motorcycle Insurance, Indian Motorcycle history, Indian motorcycles, vintage indian motorcycle, Vintage Motorcycle Insurance. Bookmark the permalink.